I’ll be honest, I never really imagined beef enchiladas could be healthier; I was just resigned to the fact that they were a guilty pleasure saved for Cinco de Mayo or other special occasions involving tequila. Fair enough. Recently though, I found a recipe that embraced the idea of the beef enchilada but rejected the idea that it must be a guiltier pleasure. 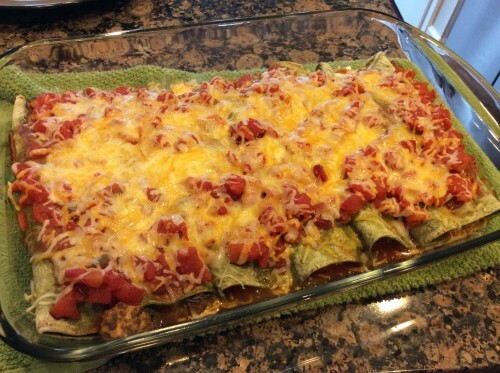 Use a little low-fat cream cheese, extra lean ground beef, low-fat Mexican cheese, and then add some extras like fresh salsa, tomatoes and spinach and you’ve got a much better for you version of your favorite enchiladas. And trust me, these spinach and beef enchiladas are just as filling as the originals. My fiance, Sean and I put these together as a team – it’s much easier to make enchiladas when you have one person putting the filling on the tortilla and the other rolling the tortillas up and placing them in the baking pan. Even by yourself though, this is an easy dish to put together. Once the filling’s done, the enchiladas sit in the pan and it bakes with salsa and cheese until everything is gooey and bubbly and delicious. 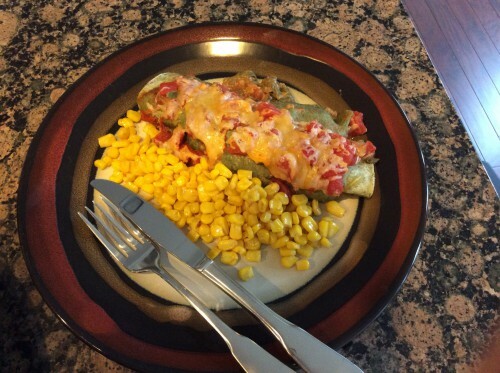 I hope you enjoy these healthier enchiladas as much as we did. Cook ground beef in a large skillet over medium high heat with the creole seasoning, garlic powder and onion powder, until it is cooked through. Add 1 c. of salsa, the spinach and 1/2 tsp. of cumin. Cook, wilting the spinach down and stirring continuously. After 2 to 3 minutes when most of the liquid has evaporated, add the cream cheese to the skillet and stir until blended. Remove the skillet from the heat and spoon the mixture evenly onto the tortillas, rolling them up and placing seam side down in a 9×13 inch glass baking dish. In a small bowl, stir together the rest of the salsa, cumin and the can of tomatoes. Pour the red sauce over the enchiladas, and bake for 20 minutes. Top with the cheese bake for another 5 minutes until the cheese has melted. Serve one enchilada per person (we did ours with a side of skillet corn). Enchiladas hot out of the oven! You’re right! I was under the same impression before I came up with this recipe. I hope you enjoy it!